Dolly Varden can grow to lengths of over 30 inches and weigh nearly 30 pounds. 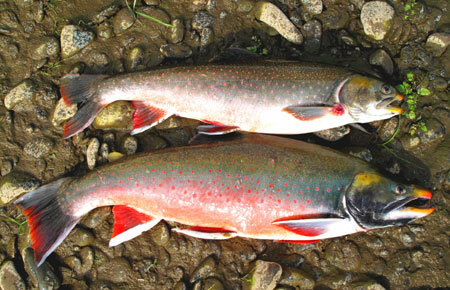 Though similar to, and often confused with, trout, Dolly Varden are actually a char (Salvelinus sp). To tell a char from a trout, look at their spots—char have light spots (white or yellow to red) on a dark body, while trout have dark spots (brown to black) on a light body. There are two forms of Dolly Varden in Alaska, which differ in number of vertebrae (62–65 for southern form and 66–70 for northern form) and in number of chromosomes (82 for southern form and 78 for northern form). In addition, northern form Dolly Varden can attain a much larger size (up to 27 pounds) than southern-form fish. The southern form ranges from Southeast Alaska throughout the Gulf of Alaska to the south side of the Alaska Peninsula and the Aleutian and Kodiak islands. The northern form ranges from the north side of the Alaska Peninsula northward to the Mackenzie River in Canada, and in the Susitna drainage in Southcentral Alaska. Both freshwater-resident and sea-run populations occur in both the northern and southern forms. Freshwater-resident Dolly Varden are often dwarfed (maturing at 3–6 inches), and are most-commonly found in small headwater streams without easy access to the ocean, or in land-locked lakes and ponds. Dolly Varden may also choose to remain in fresh water if they have access to a large, productive lake or river, in which they may grow to a similar size as sea-run Dolly Varden. Juvenile Dolly Varden (and freshwater-resident adults) vary in color depending on the waters they inhabit. In clear streams and lakes, young Dolly Varden are usually olive-brown, but in glacial streams they are pale silver-gray. While living in freshwater before going to sea, young Dolly Varden have 8–12 dark, irregularly-shaped vertical bars (parr marks) on their sides straddling the lateral line. Pale white or orange to red spots, brightening at the onset of maturity, begin to develop when juveniles reach 3–4 inches in length. While in the ocean, and for a short time after entering fresh water, adult sea-run Dolly Varden are silvery with a faint green sheen overlain with light orange spots. Once they reach fresh water, this silvery appearance transitions into greenish-brown with dark-orange to red spots. As spawning season approaches, males become brilliantly colored with red, black and white bellies, black gill covers, bright orange to red spots, and bright orange and black fins with a bright-white leading edge. Males also develop a strongly-hooked jaw (kype). Female spawners develop similar characteristics, but to a lesser degree. Freshwater forms of Dolly Varden have olive-brown (when in clear streams) or pale silver-gray (when in glacial streams) sides overlain with orange to red spots. As spawning season approaches, adults develop spawning colors as described above for sea-run Dolly Varden. Dwarf freshwater forms often retain parr marks as adults. Dolly Varden look like, and are often confused with, Arctic char. Dolly Varden generally have a greenish body with many small (smaller than the pupil of the eye) spots, a relatively-thick caudal peduncle (constriction in body at base of tail fin), and a slightly-forked tail. Arctic char, in contrast, generally have a bronzish-yellow body with fewer and larger (larger than the pupil) cream-to-orange colored spots, a slim caudal peduncle, and a noticeably-forked tail. Spawning male Dolly Varden usually develop a distinct kype, which is absent or reduced in spawning male Arctic char. In Alaska, Dolly Varden spawn and usually live in streams and rivers (although southern-form Dolly Varden usually overwinter in lakes) and may migrate to and from the ocean, but Arctic char in Alaska generally complete their entire life cycle in lakes. Dolly Varden grow slowly in Alaska, maturing in 5–6 years at a length of 12–16 inches for the southern form, and 5–9 years at a length of 16–24 inches for the northern form. Dwarf, freshwater-resident forms mature earlier (age 2–4) and at a much smaller length (3–6 inches). Southern form Dolly Varden rarely live longer than 8 years, reaching sizes of up to 28 inches and 10 pounds. Northern form Dolly Varden live up to 16 years and reach sizes of over 30 inches and 20 or more pounds. Unlike pacific salmon, Dolly Varden are capable of spawning multiple times during their lives, but they rarely survive to spawn more than 3 times. Depending on food availability, adults, particularly in the northern form, may skip a year or two between spawning events. Dolly Varden spawn in the fall, between September and November, over gravel beds in small headwater streams or occasionally in larger rivers. The female, depending on her size, will deposit 600–6,000 eggs (2,500–10,000 in the northern form) in nests (redds), which she digs in the streambed gravel with her tail while turned on her side. As the female deposits eggs, one or more males simultaneously fertilize them. The fertilized eggs (embryos) remain in the gravel for 4–5 months, depending on water temperature, prior to hatching. Hatchlings (alevin) remain in the gravel for an additional month or two, while absorbing nutrients from the yolk sack and continuing their development. Juveniles (fry) usually emerge from the gravel in April–May (southern form) or June (northern form) and disperse into slowly-flowing areas along stream margins. In May or June of their 2nd–4th year in freshwater, some young Dolly Varden (now called smolts) prepare to enter saltwater. To accomplish this transition, they change many aspects of their bodies, including color (lose parr marks and become silvery), shape, physiology, and behavior. They spend the summer feeding at sea and growing rapidly, then return to freshwater to spawn and spend the winter. Dolly Varden are carnivorous, feeding opportunistically on a variety of prey. Prey species and feeding techniques vary greatly between regions, habitat types, and seasons, depending on food availability. Juveniles feed primarily on the stream bottom in slow-flowing areas near the banks. Their diet often consists mostly of winged insects and the larvae of mayflies and midges. As they grow, Dolly Varden redistribute to deeper pools and eddies where they eat crustaceans, salmon eggs, and small fish, in addition to insects. In the spring, sea-run Dolly Varden continue feeding while migrating to salt water, during which time they also eat outmigrating salmon fry where available. In the ocean, Dolly Varden range from near-shore habitats to the open ocean and feed on amphipods and small fish such as juvenile salmon and sandlance. Sea-run Dolly Varden are also known to follow salmon into rivers in order to feed on their highly-nutritious eggs. Dolly Varden have been much maligned as a predator of salmon. From 1921 to 1941, there was a bounty on Dolly Varden in Alaska. It was terminated when analysis of the 20,000 tails submitted for payment in 1939 revealed that more than half were from coho salmon, and of the remainder, more were from rainbow trout than were from Dolly Varden. Although Dolly Varden do eat salmon eggs and salmon fry, they have not been found to be significant predators in areas where their feeding habits have been studied. They primarily eat drifting salmon eggs that would not have hatched anyway. They are more of a scavenger than a predator. In fact, they perform a beneficial hygienic function, eating dead or fungus-infected eggs that could infect the entire redd. In cases where they eat salmon fry, Dolly Varden primarily feed on pink salmon. Their ability to capture these is directly related to fry abundance. Thus, more fry are eaten when large numbers are available, and the overall effect on the salmon population is less significant. When other fish such as Arctic char, cutthroat trout or young coho salmon are present, Dolly Varden have always been shown to be the least effective predator. Dolly Varden migration patterns are highly variable. Most southern-form Dolly Varden spend winters in lakes, while the northern form usually overwinter in rivers or springs. While at sea, Dolly Varden generally stay near shore, but may travel long distances along the coast, frequently ascending rivers to feed or to find a suitable place (lake or river) to spend the winter. The movement of a Dolly Varden between North America and Russia (over 1000 miles) is the greatest distance documented. After feeding at sea during the summer, southern-form Dolly Varden whose home stream has an attached lake usually return to that same lake each winter. However, southern-form fish originating from a stream without a connected lake must find a lake in which to over-winter. Northern-form Dolly Varden in Northwestern Alaska exhibit two different life-history types and are commonly referred to as summer and fall spawners. These two types differ greatly in the time they spend in freshwater before and after spawning. Summer spawners remain in freshwater about 20 months, while fall spawners remain about nine months. The Dolly Varden is one of the most widely-distributed salmonids in Alaska. It occurs throughout the coastal areas of the state from Southeast Alaska across the Gulf of Alaska and the Bering Sea into the Beaufort Sea to the Mackenzie River in northern Canada. It also occurs in streams in Interior Alaska and the Brooks Range. Elsewhere, their range stretches along the Pacific coast of North America from Washington State to the Arctic coast of Canada, and along the Pacific coast of Russia south to Japan and Korea. Freshwater habitats of Dolly Varden range from the smallest headwater stream (often less than 3 feet wide) to large deep lakes. Saltwater habitats range from brackish estuaries to fully-marine shoreline environments, and occasionally the open ocean. Dolly Varden spend winters in lakes (southern form) or rivers (northern form). Entire populations of freshwater-resident Dolly Varden may spend their entire life cycle within a single stream, and during the winter, the entire population may reside at a single springs. Dolly Varden are abundant and widely-distributed throughout their range. 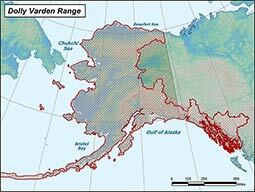 Populations of Dolly Varden are generally stable throughout Alaska. Local Dolly Varden populations are increasingly subject to threats from human harvest, mining, urbanization, migratory barriers, timber harvest and climate change. North Slope populations that spend the winter in a single spring are extremely vulnerable to predators, human harvest, or other human activities that alter groundwater flow. Statewide, especially in coastal areas, but also in streams of Interior Alaska and the Brooks Range. Insects, crustaceans, various fish species and eggs, and rodents. Otters, bears, birds, beluga whales, seals, sea lions, and humans. Annually (especially southern form), may skip spawning some years (especially northern form). Spectacular sport fish throughout its Alaskan range. The Dolly Varden received its name from a brightly-dressed character in the 1841 Charles Dickens novel, Barnaby Rudge. Dolly Varden were once considered to be a major detriment to Alaska’s populations of Pacific salmon. Extreme measures were taken to eradicate Dolly Varden, including a 5-cent bounty offered for each severed tail. A dwarf form (maturing at about 3–6 inches long) of stream-resident Dolly Varden is common in steep headwater streams statewide. The adults retain parr marks (which normally disappear on sea-run Dolly Varden by their first seaward migration). Entire Dolly Varden populations on Alaska’s North Slope may spend the winter in a single spring-fed pool. Dolly Varden exhibit diverse movement patterns—some migrate repeatedly between salt and fresh water, and some remain in the same stream or lake for their entire life. Unlike salmon, Dolly Varden usually spawn more than once in their lifetime. Dolly Varden, which normally live in streams and rivers in Alaska, are closely related to Arctic char, which normally live in lakes. Dolly Varden are a popular sport and subsistence fish throughout their range. People in northwestern Alaska are heavily dependent on harvests of sea-run Dolly Varden. The flesh is light pink and makes a delicious meal either pan fried or on the Bar-B-Q. Historically, Dolly Varden were commonly harvested (up to 190,000 pounds some years) as by-catch in the commercial salmon harvest and sold fresh, frozen, canned and pickled. In recent years however, this incidental harvest has dropped dramatically. The Alaska Department of Fish and Game (ADF&G) along with a variety of federal land management entities are responsible for managing Alaska’s Dolly Varden. ADF&G’s research on this species enables it to develop and implement sport and subsistence fishing regulations designed to enable its persistence into the future under increasing levels of pressure and habitat change. The United States Forest Service also manages a federal subsistence fishery for the Dolly Varden in Southcentral and Southeast Alaska. A great deal of research has been done on Dolly Varden by governmental and non-governmental organizations as well as by many colleges and universities around the country and the world. A vast amount of resources are available on this species focusing on population trends, migratory patterns, physiological attributes, genetic structure across its range, etc. There are several opportunities for direct public involvement in management of Dolly Varden. You can get involved by submitting either a proposal or a petition to the Board of Fisheries.